Ok, technically, that is a lie. My birthday was Tuesday and I turned awesome-years-old. I even got to go out… on a date… with my boyfriend! This is exciting because he hates going out. He’d rather stay home and a)read, b) watch movies or tv shows, or c) play video games. I enjoy all these activities, but I also like to go out occasionally and have exciting food that has been prepared for me by a stranger. So, I got awesome food and that was very exciting. On a more book related note; I’m having literary ADD. I can’t seem to settle on anything right now. I’m currently attempting to read the following books: Sweet Talk by Julie Garwood, The Iron Wyrm Affair by by Lilith Staintcrow, Touched by an Alien by Gini Koch, and On Basilisk Station by David Weber. I recently abandoned (or lemmed for listeners of the Sword & Laser podcast) Chasing Fire by Nora Roberts. I just couldn’t get into that one. I did reread Charlie and the Chocolate Factory last night. I just needed something totally different. So, if you have any recommendations for me please, please, please put them in the comments below, or hit me up on goodreads or twitter. Other things in the book world that are making me super happy; I get to interview Stephanie Burgis and Nick Harkaway for the Little Professor website! I’m so excited about this. I just got Stephanie’s responses today, so that interview should go up on the site tomorrow. I read this for the Little Professor book club. It’s not my favorite of Allen’s books (that would be Garden Spells) because it’s a little… flat? Is that the word I want? I’m not sure. Despite the storyline, which is really interesting, there’s no sense of urgency. But, it’s still well written… That sounded nicer in my head. So, the plot. Our protagonist is Willa Jackson, the last of an old southern family that fell on hard times about 70 years ago. Her family founded the little town of Walls of Water, NC over a century before, but lost their money and their house, the Southern Madame. Now, socialite Paxton Osgood has restored the Madame and is opening it as a bed and breakfast. In the days before all the money was gone Willa’s grandmother and Paxton’s grandmother were best friends. However, something horrible happened that neither woman has ever talked about. Now, with all the arrangements going on for the reopening of the Madame old ghosts are starting to stir. Allen does an excellent job bringing to life the small southern town and fleshing out the characters. Willa, once a wild child has settled down to a very constrained life. She thinks that’s what her father would have wanted for her and since he’s passed away she feels she owes it to him to live his ideal. Paxton is a poor little rich girl, who somehow manages to avoid being a stereotype. She keeps waiting to start her ‘real’ life until her parents are ready to let her grow up. Willa has an assistant who determines people’s personalities based on their coffee orders. These are great characters. But they’re in a story that isn’t very urgent. The grandmothers’ secret is part of a ghost story that is meant to be running under all of the modern action, like tree roots underground. 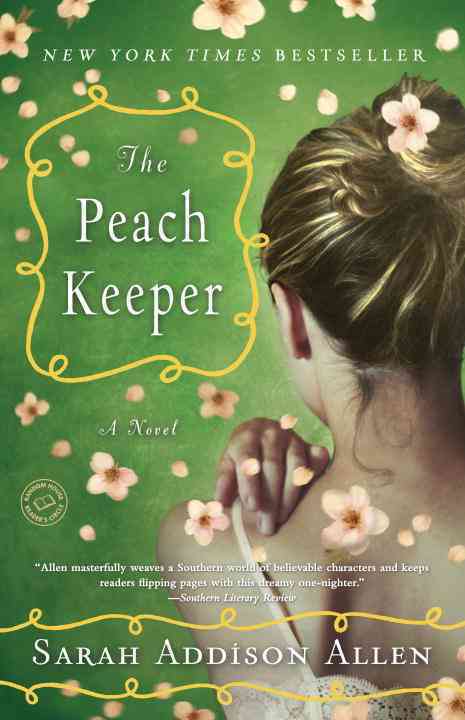 That is where the title comes from in fact, the peach tree up at the Madame is linked to the ghost. But the ghost is never very scary and almost not present at all. I think the magical elements distracted from what could have been an amazing story about friendship, choices, and letting fear hold you back. This book was a sort of unusual situation for me. It was a free ebook. I don’t read very many things on ebook, because I work in a bookstore and I’m a little afraid that the other employees will find me and lock me in a closet. But, I have a second job where it is sometimes ok for me to read books. But only if I hide it from any clients that might come in. So, my iPad, in its very businesslike leather portfolio is excellent for that. So, I’ve picked up a few ebooks, mostly ARC’s from the publishers, but every now and then I’ll take a look at the free books on iBooks or Amazon. And this particular title caught my eye. 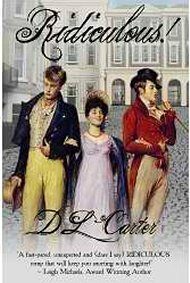 The regency era trio on the cover interested me, so I clicked through to read the description and was very interested. A family of three gentlewomen have been working as unpaid servants for a distant relative until he suddenly dies. With no one else to turn to and the workhouse as the only place for them to go, Millicent, the oldest daughter, decides to take her cousin’s place and with it, his fortune. She gets her mother and sister to help her cut her hair and dress the corpse in her own nightgown. A call to the rector and soon the unfortunate Millicent Boarder is quietly buried and the reclusive Mr. North is out on a long overdue tour of his properties. Millie is overjoyed by the freedoms she now has as Mr. North. She learns that she has a decent head for business and can manage Mr. North’s properties fairly well. However, deep friendships are, of course, out of the question. She can’t afford to have anyone look too closely at Mr. North. Everything is going well until she stops to help an overturned carriage. In the accident she meets a Lord Schoffer and his sister, who soon charm her. Lady Beth is at first shy, but soon warms up to Mr. North, who is not at all afraid to make a fool of himself to coax a smile from her. But it is her brother who truly captures Millie’s attention. He is perfect. And dangerously, definitively, distinctly off-limits. So, of course, she becomes his best friend. Oops? The characters in this book were delightful. There were a few moments where I felt distinctly uncomfortable. The great danger to Millicent comes, not from someone suspecting that she is a woman in disguise, but from gossips in town spreading rumors that she is homosexual. Schoffer distances himself from his friend in order to avoid being tarred with the same brush. Carter does a fairly good job of dancing around the homophobia of the era, but I was still fairly uncomfortable with some of the scenes that dealt with it. I’m not sure there was a better way to present the opinions, and I don’t fault the author for my discomfort at all. There isn’t a way to have homophobia in a book that I’m going to be ok with, even when it’s coming from characters I’m not supposed to like. I recommend this for anyone who wants a regency romance with a twist. Ok folks, I’m fighting off a headache so we’re going to stop with two reviews this week. No one entered my Flesh & Bone giveaway so I guess I get to keep the copy I’ve got. Have a good week everyone! I’ll see you next weekend. Happy Belated Birthday! Glad you got to go out. Sorry about your headache! Recommendations! You’ve probably already formed your own opinion of whether or not you want to read this series (it’s been around for a while), but I highly, highly recommend the Kate Daniels series by Ilona Andrews. It seems like something you would like. First book is Magic Bites, and if you read it and think “Ehhh,” just keep going, because book 2 is so much better, and 3-5 is pretty much nonstop awesomeness. Also, Seraphina (which I saw you added – yay!). It seems like something you’d enjoy, too. I started Chocolat and all the chocolate descriptions are killing me! I have no sweets in the house, which is probably a good thing, or they’d be gone already. Awesome, thanks! I’ll go take a look at Magic Bites.